Since 1920, the nonpartisan political organization League of Women Voters (LWV) has sought to improve US systems of government and impact public policies through education and advocacy. The LWV has approximately 30 full-time employees and more than 750 volunteer-led affiliates across the country. The LWV Education Fund (LWVEF) runs the website VOTE411.org, which provides nonpartisan election information to the public. The site covers topics including polling places, election dates and registration deadlines, information about candidates and ballot measures, the absentee ballot process, and other aspects of the election process. As a website devoted to elections, VOTE411.org experiences surges in volume over several days during federal election years. The rest of the time, VOTE411.org has a relatively low volume of traffic. After evaluating the proposals on cost, support options, ease of scalability, and reliability, LWVEF decided on Amazon Web Services (AWS). “AWS was exactly what we needed: a hosting solution that scaled seamlessly,” Senecal says. LWVEF built two databases using Amazon Relational Database Service (Amazon RDS). 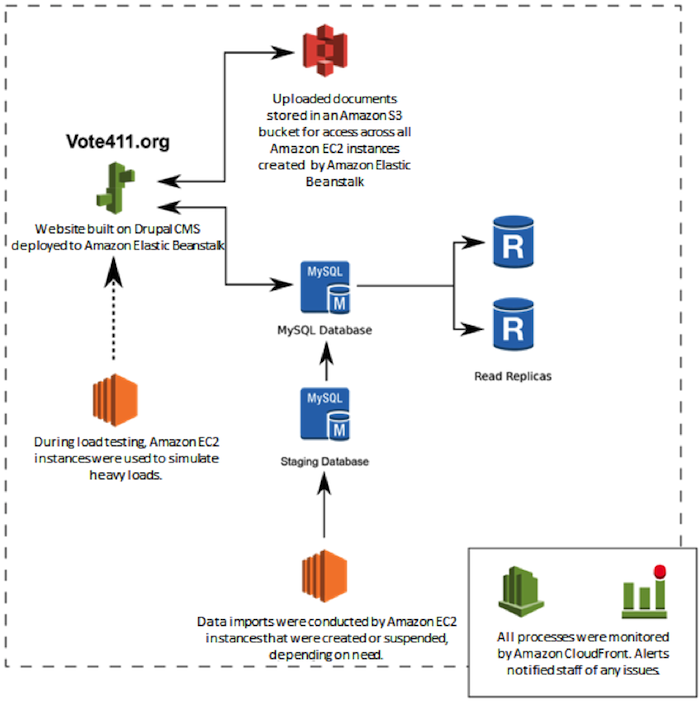 The team uses Amazon Simple Storage Service (Amazon S3) to store the 1200 voter guides and other literature produced by local Leagues and shared through VOTE411.org. Using Amazon S3 to store the files allowed the team to upload data through the Drupal interface while ensuring that the files are still available to new Amazon Elastic Compute Cloud (Amazon EC2) instances. New Mill Media deployed the web application on AWS Elastic Beanstalk for PHP and uses Amazon EC2 to scale with demand. New Mill Media built the web application with Drupal, deploying it on Linux servers running Apache and PHP. Their database was MySQL, implemented on Amazon RDS. LWVEF uses Amazon CloudWatch to monitor usage. During periods of peak usage, the LWVEF team tracked availability and load time using Apache JMeter. VOTE411.org was re-launched on AWS in August 2012. In September and October, the site saw 50,000 unique visitors per day, rising to 300,000 visitors the day before the election and 500,000 visitors the day of the election. The most data-intensive page loaded in under 400ms. Other pages loaded in under 100ms. AWS provided continual availability during peak usage, scaling from 3 server instances in August to 60 instances on Election Day. The team is exploring the use of AWS for hosting other LWV websites. For more information about using the AWS Cloud for web hosting, see http://aws.amazon.com/web-mobile-social/.